Article by Gemma Bell, with special thanks to Gill Marriott and Amanda Lees. As most of you will know, every year in early December the Oxton Amateur Players present many well-known faces guised in glitter and gowns in the village pantomime. 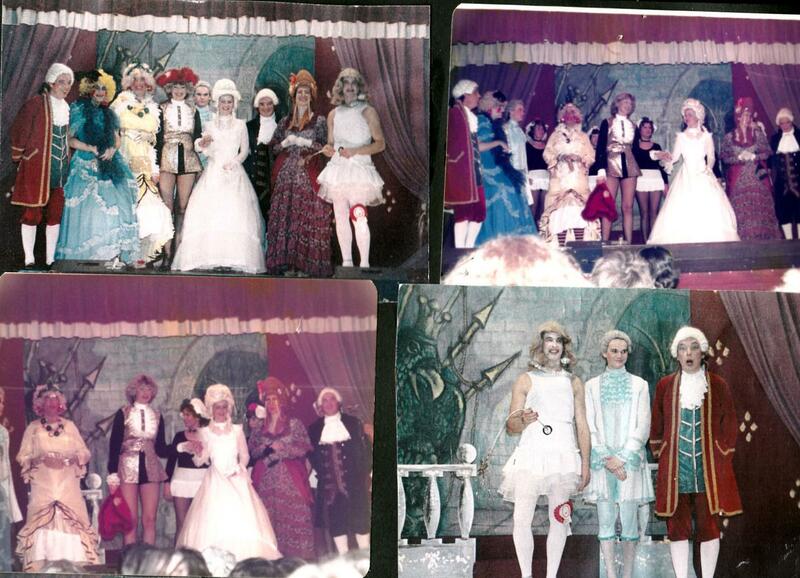 Over the years Oxton Amateur Players have earned a reputation for being one of the best amateur dramatics companies in Nottinghamshire, with the Pantomime attracting audience members from far and wide. This is something of which Oxton can be very proud. On the event of its 35th Anniversary it is only fitting to ‘look behind’ us (Sorry, all done now) and celebrate. My own involvement in the Pantomime began with the “Christmas Cracker” (2000). I remained a cast member until 2009 when I left to attend university. After producing “Hook’s Revenge” last year, I am extremely happy to be co-producing this year’s “Pantostein” with self-titled Amanda ‘I think I’m getting a bit old to play a ‘love-struck, fishnet clad, thigh-slapping’ principle boy’ Lees! Both Amanda and I can now fully appreciate the time and dedication required to produce the Pantomime and would like to take this opportunity to doff our hats to founder, Gill Marriott and her tireless side-kick Lin Jacobs. In 1978 it was customary to have lunch time wine and nibble parties and on one such occasion and a few too many wines a few of us discussed our interest in theatre and how wonderful it would to start a Theatre Group. There had been one in Oxton but unfortunately it had disbanded. The original idea was to base a show on Oxton church which has many, many years of history but as everyone now knows, it never happened as we soon discovered that we were not as clever as we first thought and writing and producing something from scratch was extremely difficult. We met on a few occasions minus the wine and decided to do a Pantomime and at that point Oxton Amateur Players was born. Our first Panto was ‘Cinderella’ which was a great success. We all had children and felt that anything within the village would be wonderful for the young ones to get involved in. This has proved to be one of the joys of the group as we watched the young members grow up, marry and in turn their children have been involved. We have new young members every year off setting the loss of our older teens to university. We seem to have been very fortunate and there have been very few problems within the group and we now have some very talented people both on and off stage. There are very few members left of the original group but we go from strength to strength and we hope that our audiences have enjoyed our efforts as much as we have. 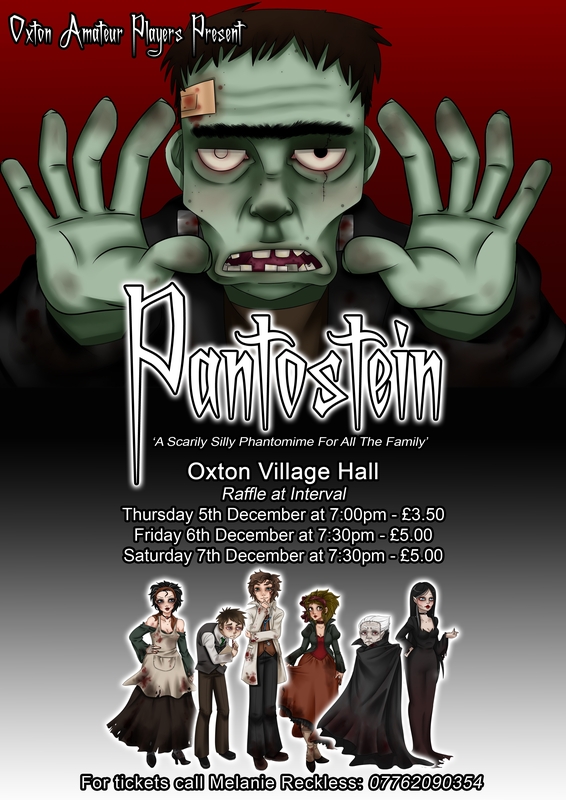 “Pantostein”, which speaks for itself, will be our 35th year and will run from 5th- 7th December. Please be part of our audience, it will be a great occasion. I really hope that our young members will take the group on for many more years to come. Price £1.25 adults 75p children. Children’s chorus, Hazel Argyle, Helen Argyle. Wendy Cooper, Sarah Lewin, Rebecca Thompson, Liza Wodsworth. If there is anyone that I have forgotten I do apologise but I have taken the information from the programme.